The U.S. Secretary of State John Kerry has emphasized Azerbaijan's role in international security system, voicing his country's interest in developing strong and long-term cooperation with Baku. Kerry, who addressed the journalists prior to a meeting with President Ilham Aliyev, who is in Washington on a working visit to participate at the 4th Nuclear Security Summit, believes that Azerbaijan and the U.S. share other interests in counterterrorism. "We’re very grateful to Azerbaijan’s contributions to peacekeeping, their efforts in Afghanistan," Kerry told journalists. The bilateral relations between U.S. and Azerbaijan have already a long history of 25 years. President Aliyev believes that these relations always were very close, cordial, and now they are relations of strategic importance. The two countries also have very active political dialogue and economic cooperation. The U.S. companies have invested more than $10 billion in Azerbaijan's economy. Azerbaijan and the U.S. enjoy mutually beneficial energy cooperation as well. Azerbaijan's role in ensuring the energy security of Europe is also welcomed by the U.S. and the White House strongly supports the Azerbaijan-initiated Southern Gas Corridor project, which will carry the Shah Deniz 2 gas to European consumers. Kerry said that this project is a very important step with respect to Europe’s long-term strategic interests "and frankly, to try to diversify the sourcing of energy, which is important." President Aliyev said that Azerbaijan is very grateful to the U.S. for its strong support in implementation of this project. "Frankly speaking, without that support, it may have taken much more time and effort to implement the project. We are on track, we’ll be on time, and in two, three years, the Southern Gas Corridor will be in operation," he added. Azerbaijan also plays and important role in the U.S.-led anti-terrorism policy. Since regaining its independence in 1991, Azerbaijan has been actively involved in combat against cyber crimes and nuclear terrorism. Azerbaijan has also been active in peacekeeping operations conducted under the auspices of NATO in Afghanistan and Iraq. Today, Azerbaijan provides its logistical support in operations in Afghanistan, overflights, and land transportation. The South Caucasus nation also has 100 servicemen serving shoulder to shoulder with NATO servicemen in Afghanistan. Being a leading nation in the South Caucasus, Azerbaijan is a strategically vital partner to the U.S. on combating terrorism, secularism, nuclear and conventional security, energy and foreign policy. The U.S. is one of three co-chairs of the OSCE Minsk Group, an international framework established to settle the long-standing Armenian-Azerbaijani Nagorno-Karabakh conflict. "We are grateful to the U.S. Government for their efforts in finding ways to resolve long-lasting conflict between Armenia and Azerbaijan," President Aliyev said. "We think that the conflict must be resolved based on the United Nations Security Council resolutions, which demand immediate and unconditional withdrawal of Armenian troops from our territories. The conflict between Armenia and Azerbaijan, all the conflicts in post-Soviet area and in the world, must be resolved based on territorial integrity of the countries." Kerry, in turn, voiced the U.S. interest in seeing an ultimate resolution of the frozen conflict of Nagorno-Karabakh "that needs to be a negotiated settlement and something that has to be worked on over time." "I want to thank the President for his presence here for the Nuclear Security Summit and for the many courtesies that he has shown recently as he moves to adjust the economic opportunity for Azerbaijan as well as the security relationship with the region," he added. 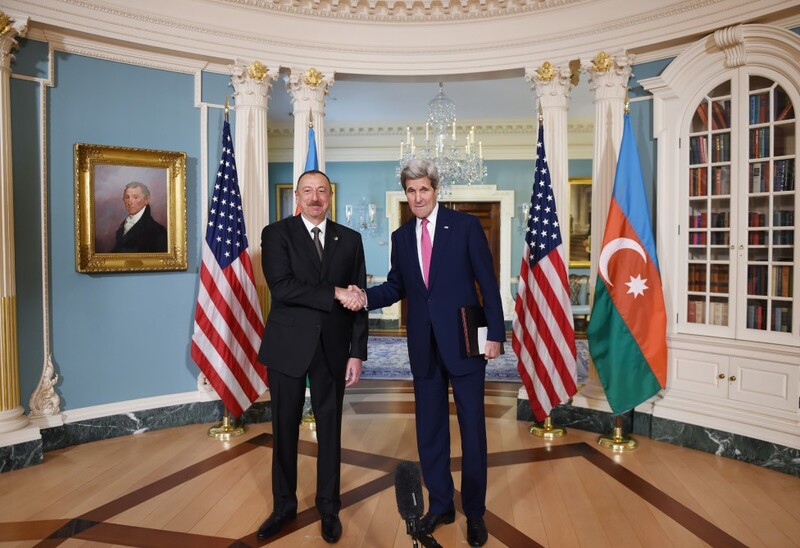 Azerbaijan and the U.S. also enjoy close partnership in issues related to regional security. Today, both countries are interested in further developing all-out relations in all fields. Kerry said at a meeting with President Aliyev that Washington is interested in developing strong and long-term cooperation with Baku. He said economic reforms, economic diversification are followed in the U.S. with interest. President Aliyev, in turn, spoke of work done in Azerbaijan's economic sector and highlighted key economic priorities and reforms in agriculture, information and communication technologies, taxes and customs, and infrastructure. He said Azerbaijan maintained close cooperation with international organizations in legislative processes of economic development. Azerbaijan's role in ensuring Europe's energy security was underlined as well and the U.S. support for Azerbaijan on this front was hailed at the meeting. The importance of the Southern Gas Corridor project was also stressed. President Aliyev said Azerbaijan preserves main economic parameters despite the falling oil prices, adding that the country's economy is in good condition. The head of state said vital measures are taken to strengthen the budget system in Azerbaijan amid the oil price fall. They said there is mutual interest in the U.S. companies' more active presence and investment in Azerbaijan. As part of the visit to Washington, President Aliyev also met with the U.S. Secretary of Commerce, Penny Pritzker, and the sides discussed ongoing economic processes in Azerbaijan, measures taken in the country to prevent and eliminate unemployment, the role of customs and tax reforms in developing the national economy, as well as prospects for cooperation in the field of agriculture, and ways of expanding trade relations. Later, President Aliyev met with heads of the American Israel Public Affairs Committee, National Coalition Supporting Soviet Jewry and the Conference of Presidents of Major American Jewish Organizations. The sides noted that such meetings have already become traditional, opened good opportunities for conducting a mutual exchange of views and contributed to the strengthening of cooperation. President Aliyev also held a meeting with a group of U.S. congressmen and the sides noted successful development of the Azerbaijani-U.S. relations in a number of areas, particularly politics, economy, energy, defense, and security. The 4th Nuclear Security Summit will convene on a difficult time when multiple risks undermine the global security. This year, the world leaders will discuss these threats and highlight steps that can be taken together to minimize the use of highly-enriched uranium, secure vulnerable materials, counter nuclear smuggling and deter, detect, and disrupt attempts at nuclear terrorism. Azerbaijan's participation at this Summit, which will bring together 52 delegations from world countries plus four delegations from the United Nations, the International Atomic Energy Agency, the European Union and the International Criminal Police Organization, is also seen as an opportunity for opening a new page in Azerbaijan's cooperation with the West. Officials believe that President Aliyev's participation at the Summit will lead to further proximity between Washington and Baku.